A new entity, the National Blindness Professional Certification Board, has been created to offer a certification process for specialists in work with the blind. At present this board offers one professional certification--the National Orientation and Mobility Certification, which emphasizes nonvisual instruction, structured-discovery learning, and performance-based certification. Other certifications will be developed in the future for teachers of blind students, vocational rehabilitation counselors, and rehabilitation or independent living teachers. What is this new board all about? What does it do and, for that matter, why was it established? What is nonvisual instruction? What is structured-discovery learning, and what is performance-based certification? Who are the people involved with this new board? These and similar questions have been and will continue to be raised by those who are interested in the organized blind movement and high-quality state or private services for the blind: thus this article. Sadly, Monitor readers will find it necessary to familiarize themselves with yet another set of jargony words and phrases. By way of background, travel training did not become a distinct profession until the mid-1940's. Prior to that time home teachers had provided some rudimentary instruction as a part of their duties, or a teacher at the school for the blind would have been assigned to pass on travel tips to the upperclassmen. Ever since orientation and mobility instruction developed into a full-time occupation, many uncertified professionals have been outstanding in their specialty fields and have received their training from agencies for the blind rather than university programs. They are what might be called agency-trained, and many have been of enormous help to thousands of blind people. In fact, my own travel teacher in the Iowa Commission for the Blind's Orientation and Adjustment Center, a man named Jim Witte, was agency-trained. He was as fine a travel teacher as there has ever been in America, and many of today's leaders nationally in the blind community--people who are completely independent and go where they want to go when they want to go there--were trained by Witte. Eventually university programs began to be established and master's degrees were offered to prepare experts in work with the blind, particularly travel teachers. What had been referred to by some of the agencies as travel training became Orientation and Mobility (O&M) in the university programs, and one university went so far as to refer to its university-trained travel teachers as peripatologists. No one could argue with either the purpose or lofty intent of this effort. Who among us would be opposed to finding and training the best possible specialists to provide the training blind people need in order to become empowered and prepared for normal, independent, competitive, and successful life? After all, as many said, "We're all working for the same thing, aren't we?" Doubtless many outstanding blindness specialists have come out of these university programs, and the blind have been the fortunate beneficiaries of this excellence. In time, however, certain problems also arose. Significant and damning myths and misconceptions came to the fore and began to be confused with facts, particularly in the area of cane travel. Some actually believed these fictions to be the fundamental truths underpinning an entirely new science: fictions such as that agency-trained specialists cannot possibly be as good or qualified as university-trained professionals and that sight is a must to teach travel to the blind. Therefore, blind students will not be admitted to the university O&M programs. When professional certification in O&M came along, agency-trained teachers were simply not certified. Further, blind travel teachers were not be certified to teach other blind people, even if they received master's degrees from university O&M programs. In a word, discrimination against the blind was both blatant and rampant in the field of travel training. This antiquated attitude about the absolute necessity for travel teachers to have sight along with the concomitant policy that the blind must, therefore, be barred forever from this rapidly developing new profession has interesting roots. One would naturally assume of course that this absolute had been sustained by scientific evidence and had been granted some kind of validating sanction. Such, however, was not the case. It is reported that, at a 1959 conference hosted by the American Foundation for the Blind, this supposed legitimate and permanent prohibition against the blind was established largely based upon an off-the-cuff response by a conference attendee to the question, "What can a sighted mobility instructor do better than a blind one at fifty paces from the trainee?" An instructor with thirty years of experience replied, "The sighted instructor can see danger and say "Stop." This statement is absolutely true. Blind people cannot see. Based largely upon this impulsive remark, however, professionals reached the conclusion that sight is needed to teach travel. This fallacy took root among the supposed experts of the day and spread like wildfire. The first organizational body in work with the blind to offer professional certification for O&M instructors was the American Association of Workers for the Blind. However, for many years now (since 1984), this certification has been offered by the Association for Education and Rehabilitation of the Blind and Visually Impaired (AER). Because of the aforementioned myths and misconceptions, AER certification was not offered to agency-trained specialists, and it was not offered to travel teachers who were blind. In fact, most of the university O&M programs themselves were closed to the blind. To be sure, these prohibitions have now been eliminated, at least officially, with a gentle bit of persuasion from both the National Federation of the Blind and the Americans with Disabilities Act, and some blind people have been let into the schools and are being certified, but this traditional training and certification continue to revolve around sight and visual techniques for instruction and certification. To jump ahead for a moment from the chronology, AER certification has now been given over to a new entity, the Academy for Certification of Vision Rehabilitation and Education Professionals (ACVREP)--the Academy. It now performs the certification function previously handled directly by AER. With this brief summary of historical facts, let's turn directly to a discussion of the National Blindness Professional Certification Board (NBPCB). What is it, and how did it come about? For a complete understanding one must first be aware of the historic facts summarized briefly above. Second, one must also be aware that a new non-discriminatory O&M master's program has been established at Louisiana Tech University in Ruston, Louisiana. The project was made possible through a federal Experimental and Innovative (E&I) Grant from the U.S. Department of Education to the Louisiana Rehabilitation Services, that state's public VR agency. This progressive state agency worked in cooperation with the Louisiana Center for the Blind and Louisiana Tech University, a member of the Louisiana university system. This historic partnership between a public VR agency, a nationally recognized private agency for the blind, and an institution of higher education pioneered the development of this new, non-discriminatory master's program, which was to be an alternative to the traditional university programs. Therefore at Louisiana Tech University all qualified students, whether blind or sighted, are invited to apply and participate. In fact, under the E&I Grant Louisiana Tech was specifically authorized to engage in targeted recruitment of blind and minority students. The first step in the Ruston effort was to identify and clarify the actual, substantive differences in instructional strategies used by blind and sighted instructors at the progressive orientation and adjustment centers around the country and those used by graduates of the university programs historically endorsed by AER. Intensive study revealed three primary differences. The first is purely philosophical. Everything the progressive centers do is based upon the fundamental conviction that blind people are simply normal people who cannot see and that the average blind person can live a normal life and compete on terms of absolute equality with people who are sighted if given proper training and opportunity. The traditional university programs promote the belief that blindness is a monumental loss or a tragedy and that the blind can never expect to compensate fully or compete on terms of full equality with the sighted, no matter what kind of training has been provided. Second, the instructional strategies used by the progressive centers rely upon a complete attitudinal adjustment through immersion in blindness and nonvisual training techniques for instruction. On the other hand the AER-supported university programs offer training which revolves around sight, and there is little if any serious effort aimed at emotional, attitudinal adjustment. Third, there is also another and different philosophical issue which is just as significant as the first. The progressive adjustment centers and blindness agencies believe that the most successful and useful O&M instructor, be he or she sighted or blind, must be proficient in the very same skills and abilities being taught to students or clients. The concept is analogous to the time-honored notion that a mathematics or English teacher first know and be expert in math or English himself or herself before being considered qualified to teach it to others. This level of expertise can be gained only through complete immersion in blindness and extensive sleepshade (blindfold) training. While the AER-endorsed university programs provide some minimal philosophical and sleepshade training (from fifty to sixty-five total hours of instruction under blindfold), this concept of actual ability to perform competently is not considered important enough to be required to demonstrate excellence. Therefore, unlike the teacher trained in nonvisual instruction, the typical AER-trained instructor would not be able to use his or her personal travel skills to serve as a positive and inspiring role model for students or customers. As the Louisiana Center/Louisiana Tech programs progressed, certain terminology emerged and crystallized. The nonvisual kind of training offered at the Louisiana Center for the Blind is known as the structured-discovery method of instruction, while traditional AER teaching is called guided learning. Under the structured-discovery method, the new student begins by being given specific instructions, but this phase of the learning continues only as long as it takes the student to master the simple, proper techniques--cane grip, arc, staying in step, and the like--but then the instruction shifts to "problem-solving after receiving general instructions." The instructor provides only the bare minimum of information; then it is up to the student to gather and process needed information, explore the environment, and rely upon himself or herself to discover the information needed to move about safely, efficiently and freely. Students learn to think and plan and to process their own information. Before long students are going out on solo routes. Experience has shown that students learn better and retain more if they figure it out for themselves. Student monitoring is done non-visually. On the other hand, the traditional training, commonly called route or point-to-point travel, is referred to as guided learning. The instructor continually provides very specific instructions and feedback while closely monitoring the student. Guided learning revolves around sight and sighted instructors and visual monitoring. The alternative, structured-discovery method is based upon the concept of teaching the same nonvisual techniques to teachers of the blind that are used for mobility by the blind themselves. Clearly it is a superior method of teaching independent travel. Actually, however, it is not a new teaching method at all--having been used for years by agency-trained instructors--but it is new to the university scene and master's programs. Therefore the Louisiana Center/Louisiana Tech master's program became totally committed to and revolves around nonvisual, structured-discovery teaching, and the outcome has been gratifying. Then one additional but significant fact comes into play. As a second part of the U.S. Department of Education's E&I grant, a new, non-discriminatory alternative certification process for O&M instructors was to be developed. This alternative was needed for several reasons: First, a growing number of states require the certification of specialists in the blindness field, and quality certification is needed. Second, historically AER certification had been closed to blind candidates. True, recently the prohibition against the blind has officially been lifted, but blind candidates seeking certification are still expected to teach others using visual techniques. Finally, there are the many agency-trained O&M specialists around the country, who, while they do not have master's degrees from university programs, are outstanding O&M instructors, deserving certification and professional recognition and qualification. Thus the National Orientation and Mobility Certification (NOMC) was developed. By way of comparison, the AER/Academy system certifies candidates based upon having received a university O&M master's degree from an AER-approved program and passing a multiple-choice test. Generally, those receiving such master's degrees and taking this multiple-choice test cannot perform expertly the very tasks and techniques which they are expected to teach to their blind students or clients. In contrast, the new performance-based procedures for qualification for certification require that, in addition to demonstrating (through rigorous testing) a knowledge of the blindness field and positive attitudes about blindness, to become certified to teach the blind, the candidate must also be able to demonstrate his or her ability to perform the tasks or techniques which will be taught to blind students or clients. Thus it is performance-based. If the candidate for NOMC certification is sighted or partially blind, then the performance part of the examination is conducted under sleepshades and tests competence performing both indoor and outdoor travel. A number of outstanding professionals in work with the blind wrote, re-wrote, tried, and tested for more than four years developing the original NOMC documents for the certification of individuals to prepare them for public use and acceptance. Key among these were Mrs. Joanne Wilson, then director of the Louisiana Center for the Blind and current Commissioner of the Federal Rehabilitation Services Administration; Dr. Ruby Ryles, Coordinator of Professional Development, Professional Development and Research Institute on Blindness, Louisiana Tech University; Ms. Suzanne Mitchell, Blind Services Executive Director, Louisiana Rehabilitation Services, and past president of the National Council of State Agencies for the Blind; Mr. Roland Allen, NOMC, Louisiana Tech O&M Program Instructor; Mr. Edward Bell, NOMC, O&M master's degree graduate from Louisiana Tech; reviewer comments from Dr. Fredric K. Schroeder, NOMC, former Commissioner of the Rehabilitation Services Administration; and, toward the completion of the project, Dr. Ronald J. Ferguson, COMS, Senior Research Fellow, Professional Development and Research Institute on Blindness, Louisiana Tech University. Drs. Ryles and Ferguson have jointly developed a second package--the NBPCB'S certification process for approved university programs. Once the NOMC process was tried, tested, proven, and in place, it was determined that an entire new national body made up of professionals possessing diverse backgrounds and experience and with broad representation from around the country should be created to handle and oversee not only NOMC certifications but also many others which are urgently needed in the blindness field. Thus the National Blindness Professional Certification Board, Inc., (NBPCB) was created. This new agency was incorporated under the laws of Maryland on June 15, 2001. 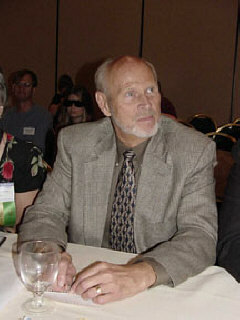 Those currently on the NBPCB Board of Directors are President, Mr. James H. Omvig, Ruston, Louisiana, blind attorney and former director of rehabilitation centers in both Iowa and Alaska, former director of a Social Security program to create greater employment opportunity among the blind and disabled within SSA itself, and author on issues concerning blindness; Vice President, Dr. C. Edwin Vaughan, Atherton, California, Professor at the University of Missouri and Menlo College, and author of numerous books in the blindness field; Secretary/Treasurer, Dr. Ronald J. Ferguson, Ruston, Louisiana, Senior Research Fellow, Professional Development and Research Institute on Blindness, Louisiana Tech University, researcher and author on issues concerning blindness, and Academy-certified mobility instructor; Mr. James R. Gashel, Baltimore, Maryland, Director of Governmental Affairs, National Federation of the Blind, and former orientation center director, Iowa Commission for the Blind; Jamie C. Hilton, Newark, New Jersey, Director, New Jersey Commission for the Blind and Visually Impaired and former President, National Council of State Agencies for the Blind; and Dr. Fredric K. Schroeder, NOMC, Vienna, Virginia, master's degreed O&M instructor, former director of special education programs for the Albuquerque, New Mexico, schools, former Director, New Mexico Commission for the Blind, former Commissioner, Federal Rehabilitation Services Administration, currently Research Professor at San Diego State University, and Director of the Professional Development and Research Institute on Blindness, Louisiana Tech University. Twelve individuals presently serve on the NOMC Certification Committee, and Dr. Ron Ferguson is Committee Chairman. Three-member certification teams conduct individual examinations. As indicated at the beginning of this article, other certifications for blindness professionals will be developed eventually, and additional certification committees will be established as needed. Dr. Ferguson may be contacted for information by phone at (318) 251-2891 or by e-mail at <fergusonr@lcb-ruston.com>. This is a new day in work with the blind. The age of enlightenment has come to this field, and we of the National Blindness Professional Certification Board are gratified and honored to be a part of the revolution. By working together in a real spirit of partnership, the organized blind and professionals serving the blind will be unstoppable. The devastating unemployment rate among blind people of working age can steadily be reduced to the point where blind people who want to work can secure and hold the jobs they want and for which they are suited and qualified. Through proper training large numbers of blind people can be empowered, and that empowerment will be their passport to freedom. Arthur Voorhees, "Professional Trends in Mobility Training," Standards for Mobility Instructors (New York: American Foundation for the Blind, 1962): 18.